The Chairman of Independent Corrupt Practices and Other Related Offences Commission (ICPC), Professor Bolaji Owasanoye, has tasked Nigerian politicians to put national interest above self in order to minimize or reduce electoral violence in the country. 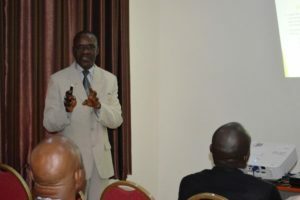 The representative of the ICPC Chairman, the Commissioner of Education Department, Mr. Muhammad Ashiru Baba, made the remarks during a retreat on Anti-Corruption and Post-Election Crisis Prevention in Nigeria organized by the Centre for Economic Reforms Initiative in Abuja for participants drawn from various agencies of government. Professor Owasanoye argued that many political office holders go into politics just to amass wealth for themselves instead of putting the interest of the nation at heart. To such people, according to him, politics was nothing but an opportunity for self-enrichment. “From humongous salaries and allowances to exploiting corruption opportunities in the systemic operations of Ministries, Departments and Agencies (MDAs); engaging in arm-twisting in the conduct of oversight functions; and outright stealing, etc. are the factors that make politics in Nigeria attractive and a do-or-die affair”, he added. The ICPC Chairman stressed that Nigerian democracy happened to be one of the most expensive in the world because Nigerians allow personal interest, mostly pecuniary in nature, to override national interest. “In Nigeria and indeed most developing countries, electoral violence is not only a recurring decimal, its frequency, character and dimensions are quite frightening. Political reality is fast becoming a national character in the Nigerian state” the Professor stressed. He noted that, the remote causes of electoral violence revolved round the desire by the political elite to win elections at all cost because most of them discovered leadership positions as the means of quick self-enrichment. ICPC Chairman, proposed that political positions in Nigeria should be made less attractive in remunerations and opportunities, as this would reduce the incidence of political elite ‘falling on top one another to win elections’. He also urged members of the political elite to search their conscience and turn over a new leaf.